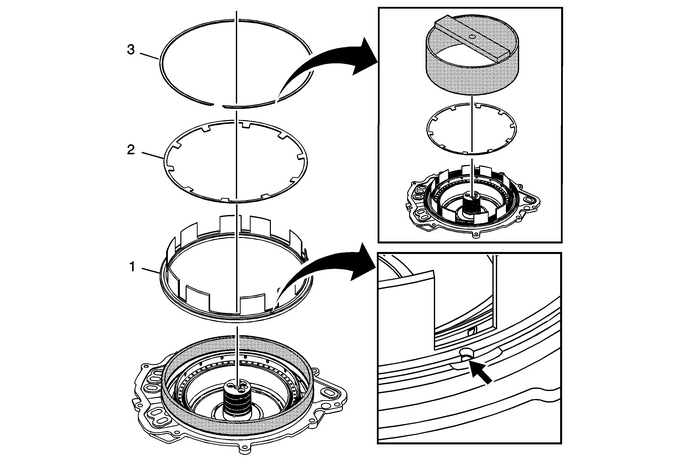 ProcedurePlace DT-46620-3 which is part of DT-46620 seal installer over the case cover hub and adjust it so that only the bottom seal ring is exposed.Place a NEW fluid seal ring onto DT-46620-3 which is part of DT-46620 seal installer.Use DT-46620-2 which is part of DT-46620 seal installer to push the fluid seal ring down over DT-46620-3 which is part of DT-46620 seal installer into the hub ring groove.Repeat the above steps to install all 4 seal rings, adjusting DT-46620-3 which ispart of DT-46620 seal installer to the appropriate ring groove. Caution:Do not force the seal installer down over the seals as thiswill roll and damage the seals. The large chamfer is designed tofit over the over stretched seal. Use a hand to help shrink theseal if the seal installer is difficult to install over the sealrings. Install DT-46620-1 which is part of DT-46620 seal installer with the large chamfer end down over the fluid seal rings and leave DT-46620-1 whichis part of DT-46620 seal installer on the seals for at least 60-seconds. ProcedureInstall DT-46620-1 which is part of DT-46620 seal installer with the small chamfer end facing down for at least 60-seconds. 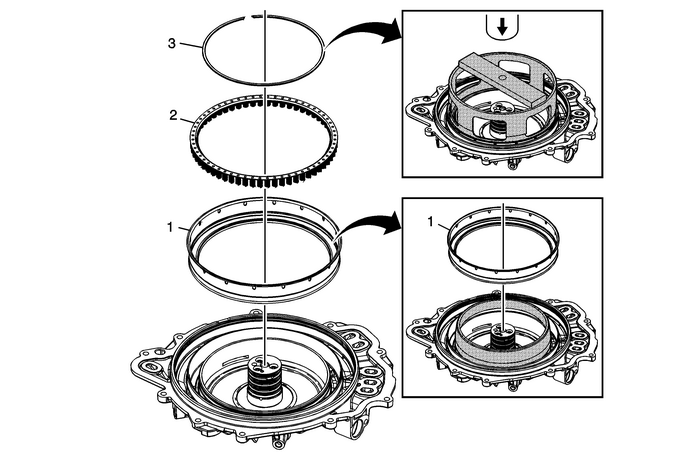 This will properlysize the bottom seal ring.Leaving DT-46620-1 which is part of DT-46620 seal installer on the fluid seal rings for an extended period of time could cause a fluid leak onthe initial clutch piston circuit until the seal rings warm up and expand to the properdimension. DT-46621 seal protector prevents the piston seal lip from damage over the retaining ring groove during installation.Apply a thin coat of ATF to the O.D. of DT-46621 seal protector to ease the installation of the piston. ProcedureInstall the retaining ring with the opening positioned to the top of the case cover.Place the retainer ring inside DT-46632 spring compressor prior to placing DT-46632 spring compressor onto the spring. ProcedureInstall the L/R piston with the air bleed positioned at the alignment feature on thecover, using DT-46628-1 seal protector. This will orient the piston fingers with the openings in the case.DT-46628-1 seal protector prevents the piston seal lip from damage during installation. Apply a thin coat ofATF to the I.D. of DT-46628-1 seal protector to ease the installation of the piston. Note:Do not align the retainer opening with other retaining ring openings. Apply shop air to the 2-6 clutch feed. 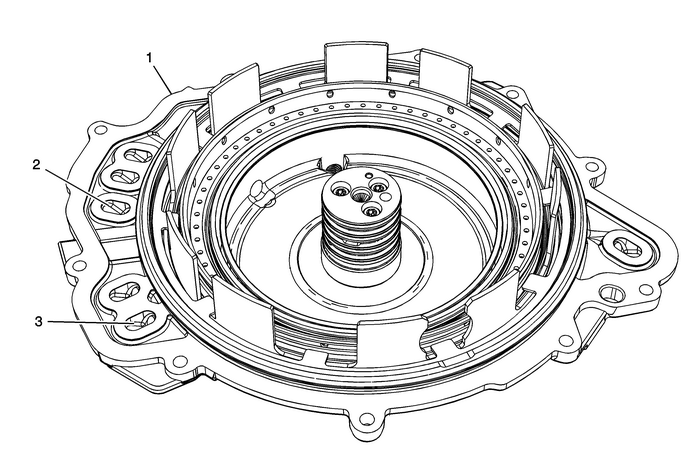 Observe the 2-6 piston movement. 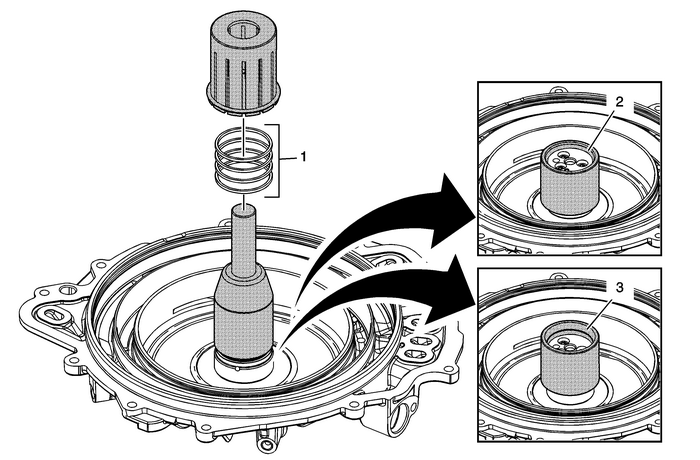 Note:Minimal piston movement and excessive air leaking could indicate damage to the 2-6piston seals or improper assembly. Apply shop air to the Low and Reverse clutch feed. Observe the Low and Reverse pistonmovement. 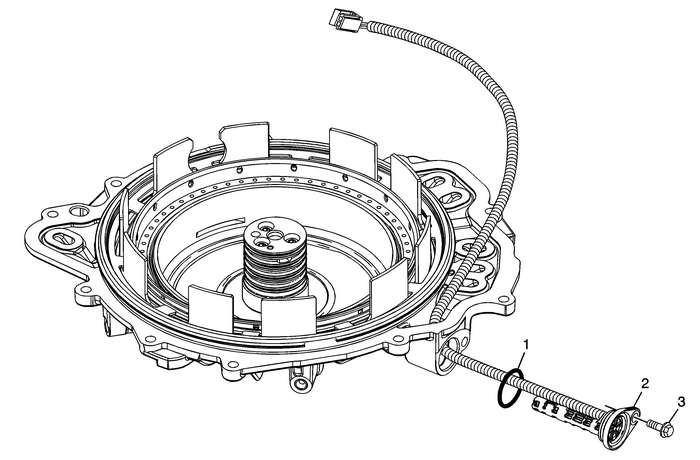 Note:Minimal piston movement and excessive air leaking could indicate damage to the Lowand Reverse piston seals or improper assembly. Apply threadlocker or equivalent to the input speed sensor bolt. Refer toAdhesives, Fluids, Lubricants, and Sealers. Note:The seal is coated with a dry lubricant. If the coating is missing, lubricate theseal with automatic transmission fluid prior to installation.